As a company who is an HP Shop for all of our servers in the datacenter, its nice to have a few good tools to make the day easier. I wanted to share some of these tools with you all, so that it may help benefit some of you. The first is useful for P2Vs of HP systems. 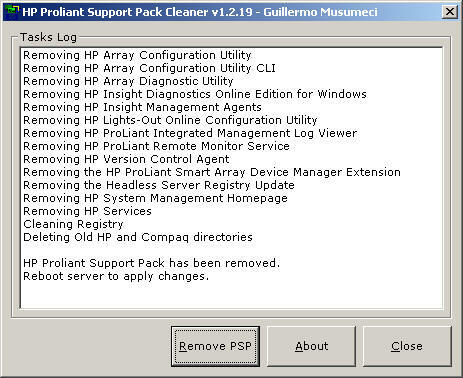 Its a free tool created by Guillermo Musumeci and is designed to remove HP Products such as the Array Config Utility and Insight Management agents installed by the HP PSPs. Since this is a major part of the cleanup of a VM after a P2V, its nice to have a tool that automates it completely. The second tool is a vCenter plugin called HP Insight Control for VMware vCenter. As you can gather from the name, these are plugins that pump management capabilities straight into vCenter as to keep you from having to jump around to multiple consoles to manage your HP ESX host. Features include in depth monitoring, remote control and power optimization straight from vCenter. If you run HP systems, its definately a great addition for vCenter, as it allows you to combine your management view over both your virtual and physical environments from one console. 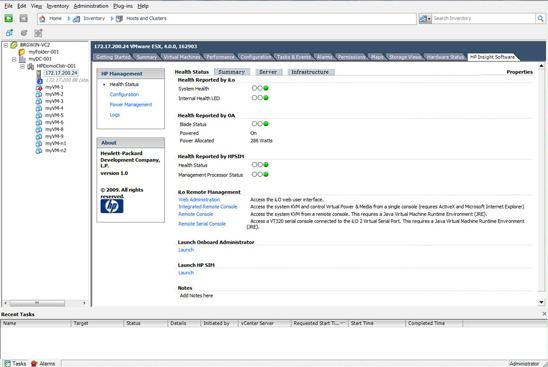 These are both great examples of tools available to help manage your HP Environment when it comes to VMware. Feel free to offer up anymore suggestions with a comment.